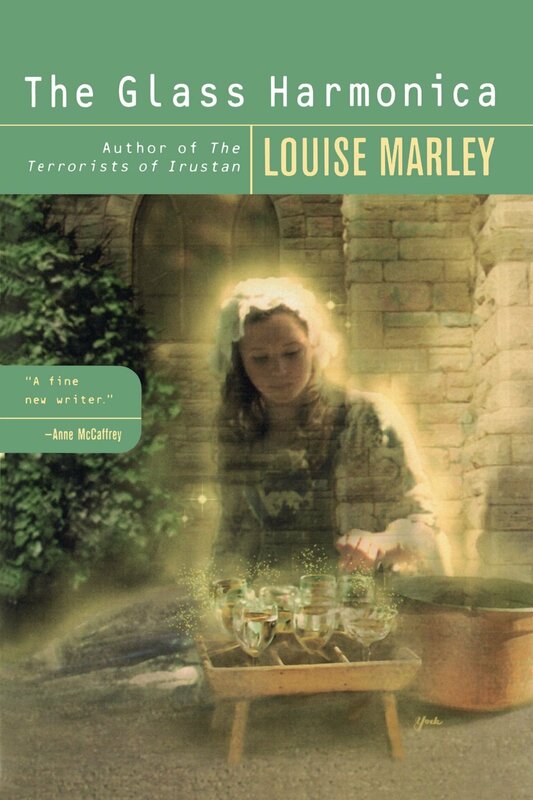 Praised by the Everett Herald as an author who “makes her writing sing,” Louise Marley takes us into the lives of two young women of two different times–bound by a passion for the ethereal music of the glass harmonica . . .
Eilish Eam is an orphan living in London, 1761. She stands on an icy corner and plays her instrument: water-filled glasses. Fingers raw from the cold, her only comfort is the place her music takes her . . . to visions of a young girl, much her own age, but with odd short hair. Eilish survives on pennies and applause, and nothing more. Until the night Benjamin Franklin stops to listen, awestruck by her gift–and with plans for her future . . .
Erin Rushton is a musical prodigy living in Seattle, 2018. She stands in the orchestra, consumed by the music of her instrument: the glass harmonica. Like a current of electricity, the music moves throughout her body. And the only thing that laters the rhythm are the visions that haunt her . . . of an odd, old-fashioned girl, much her own age, who needs her help . . . The Glass Harmonica is a retelling of history that also looks to the future, coupled with fantastic elements intertwined with science . . . Marley adds her own twist into the mix, by hinting there are things science just can't explain. The historical aspects address many of the mysteries associated with glass harmonica and Benjamin Franklin. Readers who are unaware of the historical accuracy Marley portrays may be less impressed with the past storyline than readers who know the glass harmonica's history. Marley draws extensively on her own experience in the musical scene . . . The detail she ascribes to the concert halls bespeak Marley's familiarity with them due to her performance background. The Glass Harmonica is an enchanting and engaging tale . . . there are many little things that hint at Marley's political and social agenda, but they never submerge the story. Vivid and fascinating . . . Lushly described . . . By turns sobering and delightful, The Glass Harmonica is a novel that will haunt readers. It is rare to find a book that can fit into multiple genres—and do it well. Marley's latest offering does just that . . . A well-written, engaging story. In The Glass Harmonica, author Louise Marley makes excellent use of her experience in the world of professional music. The small world of the concert circuit in 2018, which dominates Erin and Charlie's lives, is vivid and fascinating. Readers will hear the lushly described music played by both women as Erin and Eilish wrestle with the glass harmonica's alleged demons. While this novel is less overtly radical than Marley's The Terrorists of Irustan, The Glass Harmonica is not for the faint of heart. Serious concerns dominate the story: slavery, poverty and physical disability . . . the message is chillingly relevant. Marley mixes the tragedy with a good dose of romance, and even her least likable characters reveal admirable hidden qualities. She plays with the parallels between Erin and Eilish's lives in a manner delicate yet explicit. This balancing act holds through the end of the book, harmonizing elements of triumphant success and mournful loss. By turns sobering and delightful, The Glass Harmonica is a novel that will haunt readers long after they have moved on to less complex fare. The surprise here is the deft way in which Marley captures the literal sounds of the music . . . her brilliant use of music itself is language. It's the most delightful novel I've read this year. A wonderful story combining two stories separated by 250 years and the author's own knowledge of music.
. . . a wonderful, heartwarming novel. Ms. Marley's gift of lyrical prose is coupled with a deftness for weaving highly charged emotions into an exquisite tapestry of music and love, uniting science, fantasy and historical fiction into a captivating story. Marley's gift for evoking historical people and places, as well as her skillful portrayal of musical life, provide some pleasurable reading.